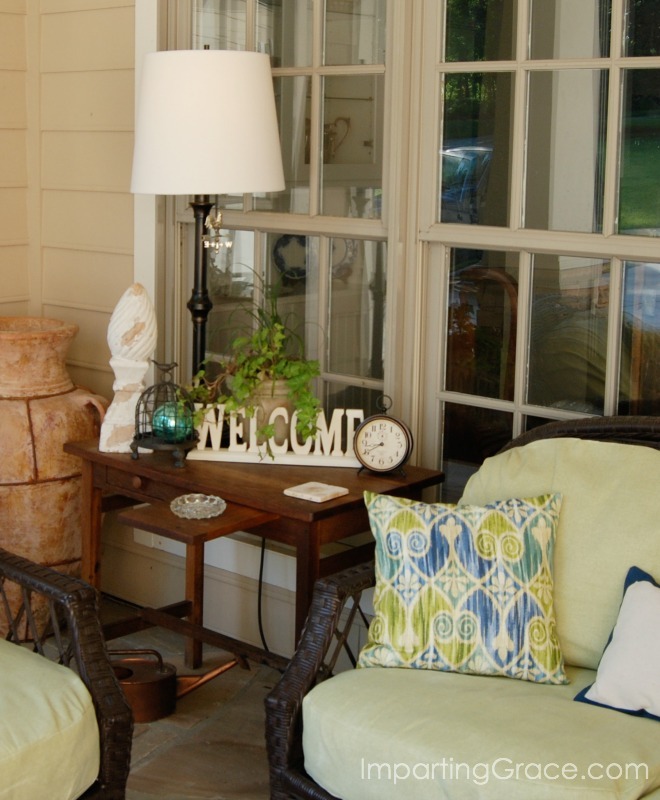 One of my favorite things about this time of year is that the weather is just perfect for enjoying time on the porch. The cold weather is past, the pollen onslaught is over, and the hot weather hasn't arrived yet. So it was time for me to make some updates to my front porch! When we were house hunting 11 years ago, I really wanted a covered entry. 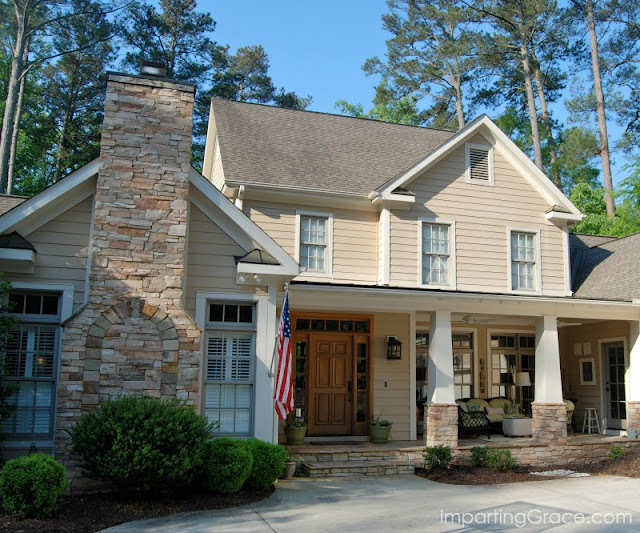 We'd always had a front door that opened to the elements, and I was hoping for some kind of roof over the front door. Little did I dream that I'd end up with not only a covered front door but also a front porch! Here's how my house looks as you walk up to it. You can see the sitting area tucked off to the right of the door. Many people have told me that when they get to this point, they just want to stop and hang out here! Having a covered front porch is a delight for us. I decided to furnish the porch as an outdoor living room, and that's exactly how we use it. When we'd lived in our house for a year, we invested in this outdoor furniture. The all-weather wicker furniture is from the "Camino Real" collection made by Lane Venture (no affiliation; just happy with the product!). This is the ninth season for the furniture, and the frames are still very sturdy. I'm guessing that next year I'll need to get new seat cushions, but by then these will have been out here year-round for 10 years. The new throw pillows are bright and cheerful. The fabric is a cotton screen print from the Colonial Williamsburg Foundation called "Sheraton Ikat." I made the pillows myself using this easy tutorial. The ottoman is a project from several years ago. I made it myself from an Omaha Steaks cooler! 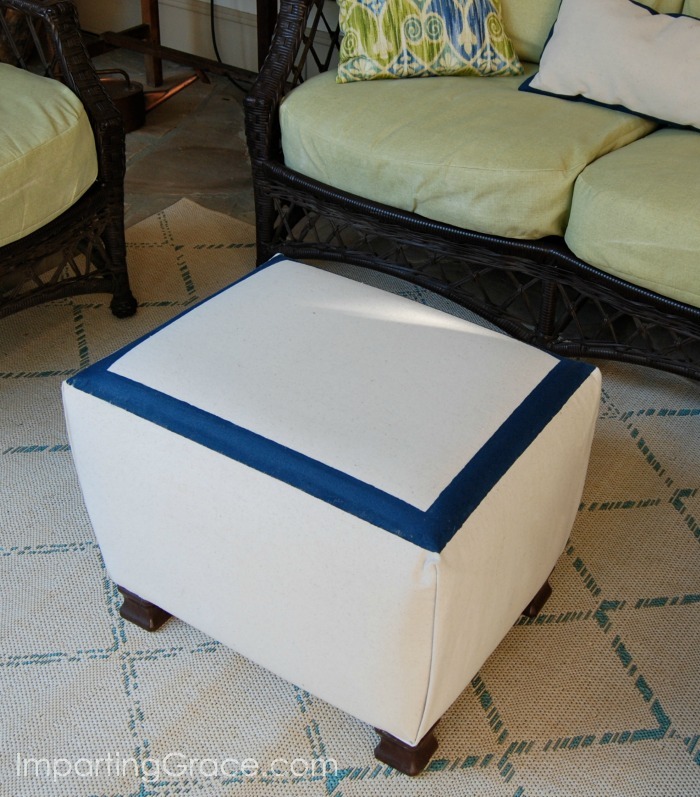 I hated to throw away that super-sturdy styrofoam box, and I realized it would be just the right size for an ottoman. I looked for fabric to coordinate with the Sheraton Ikat print. When I couldn't locate just what I wanted, I decided to go with a drop cloth. To coordinate with the ottoman, I made a lumbar pillow from drop cloth and painted its edges, too. 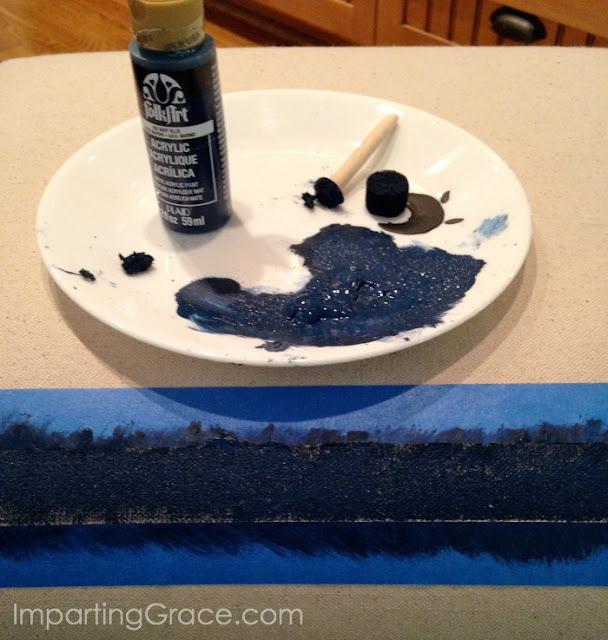 A very simple and inexpensive way to create a custom look! Our outdoor rug had not fared well, so I found a new one at Target. This one is called "Azure Diamond" from the Smith and Hawken line. The lamps were also Target finds from many years ago. I updated them this spring with simple drum shades that I sprayed liberally with ScotchGuard. One lamp sits along with a few accessories on this antique desk my parents gave me many years ago. My favorite thing is the little clock. It looks old, but it's actually from the Better Homes & Gardens line at Walmart. It's nice to be able to keep track of the time when I'm sitting out here. Time flies when you're having fun! The other lamp is a floor lamp that sits beside this little table that changes color from time to time courtesy of spray paint. Currently it's wearing a coat of Robin's Egg by Rustoleum. The obelisks in the corner I've had for years. The chalkboard I created from a Goodwill painting; I simply spray painted the frame (Heirloom White by Rustoleum) and then covered the painting with chalkboard paint. It's fun to add seasonal messages. The "antique" ceiling tiles are copper pieces I found for a few dollars; I spray painted them with Heirloom White and distressed them so they'd look antique. I've discovered over the years that wall decor for my porch needs to be pretty sturdy. I've tried several things in this little space over the sofa, but I've never been completely satisfied until I found these Letterpress Blocks from DaySpring. These are just right for the space! I'm so happy with the way my porch is looking now! Wish you could come and sit a spell with me! It is gorgeous and the weather has been perfect for sitting outside. I have been making a point to spend a few minutes relaxing outside to enjoy the gift of spring. What a beautiful spot Richella!! 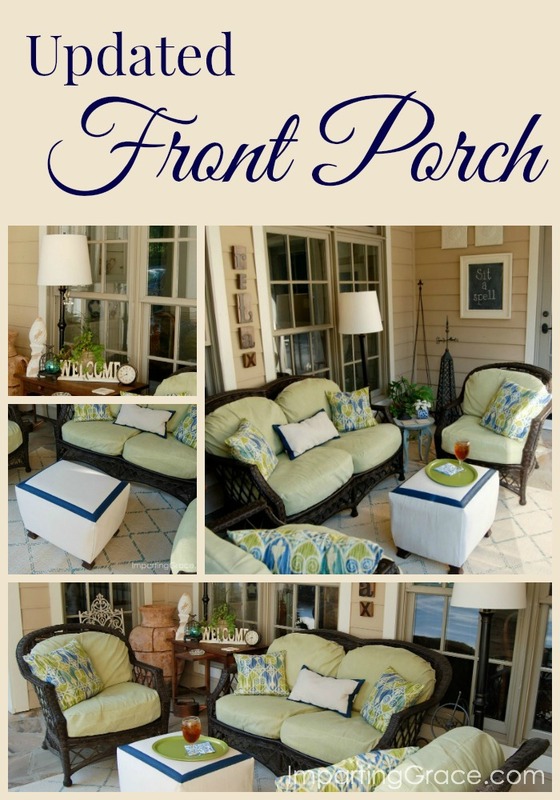 Your porch is my favorite!! What a great area! I like how your porch goes back further than being in line with the door. It helps to protect all your pretties. I have to take most of my stuff off of my porch or it will blow away. I would love to be able to put tables and lamps on mine but when it rains and is windy the porch gets wet since it faces west to east. Oh, my word! I agree with your friends...I would want to stop at your porch and not go a step further! 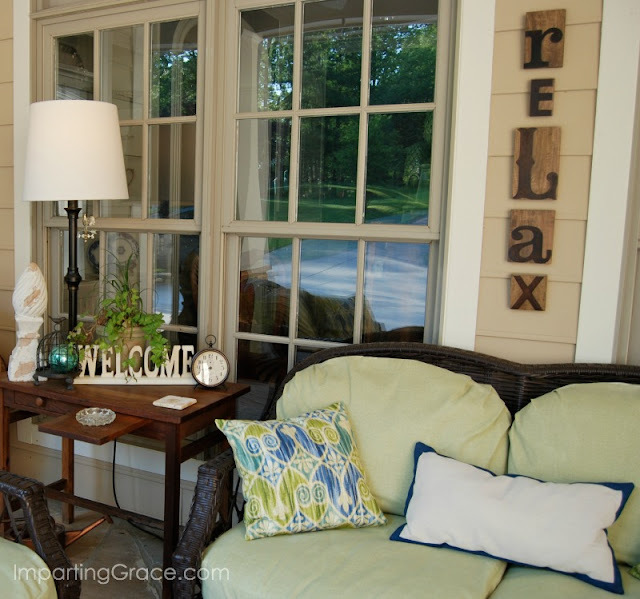 So beautiful, welcoming, warm and inviting. You have done a great job! 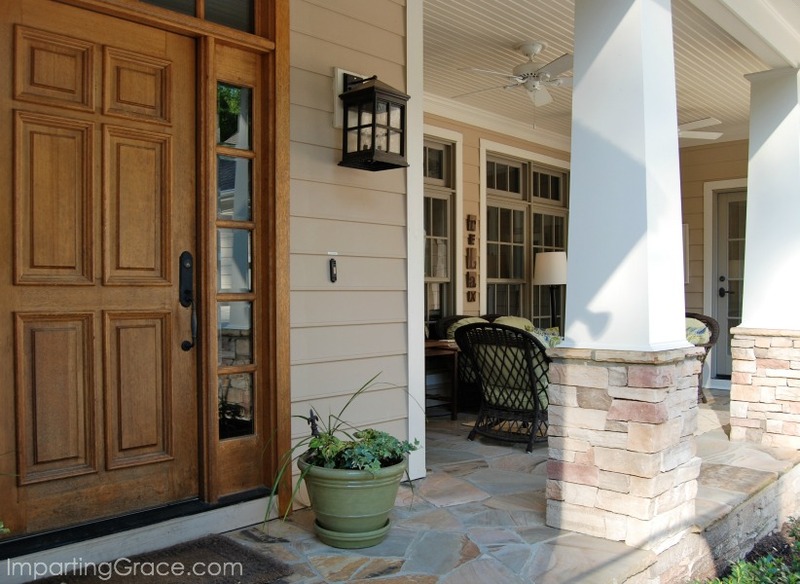 Your front porch is so inviting. My first thought when I saw your picture was, "Oh, she recovered her ottoman!" Love your new pillows. 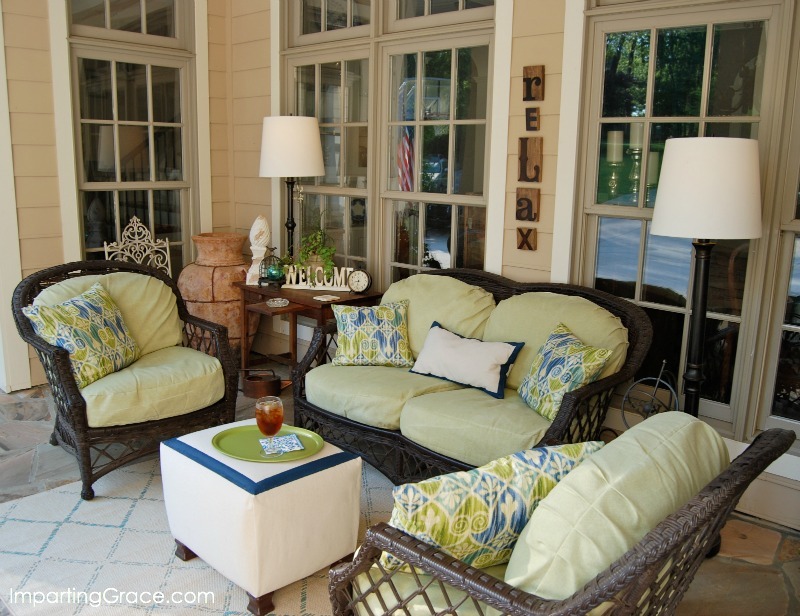 I know that you are happy to be ready for spring and summer relaxing on your porch. I love your porch! It really does look like an outdoor living room the way you have it furnished with lamps and an ottoman and accessories. I like those blocks on the wall that spell Relax too! So cute! The rug you found at Target is perfect with the colors you have in your pillows. Who wouldn't enjoy that space?! Oh my that is so inviting! always love seeing your beautiful patio. I am going to be dusting mine off and repainting the furniture in the next few days so we can start to enjoy it. have a wonderful weekend and happy mothers day! 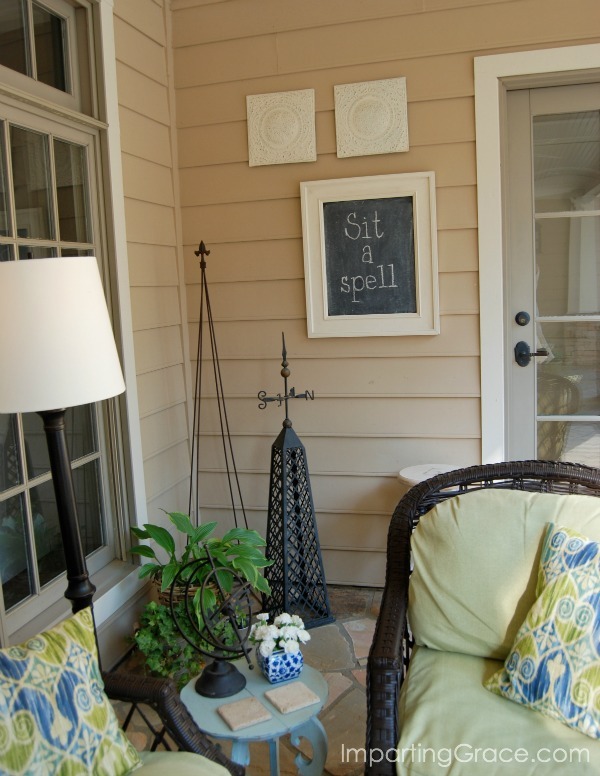 Your porch is so beautiful and looks so relaxing! I love how you made the ottoman. I've thought of covering a cooler on wheels to use at an ottoman and to not have to find a place to store it! I may copy you on that one! Your chair cushions still look great to have been out there for 10 years. I have "recover my cushions" on my never ending "to do" list this year. They only made it six years and are really starting to look dingy. 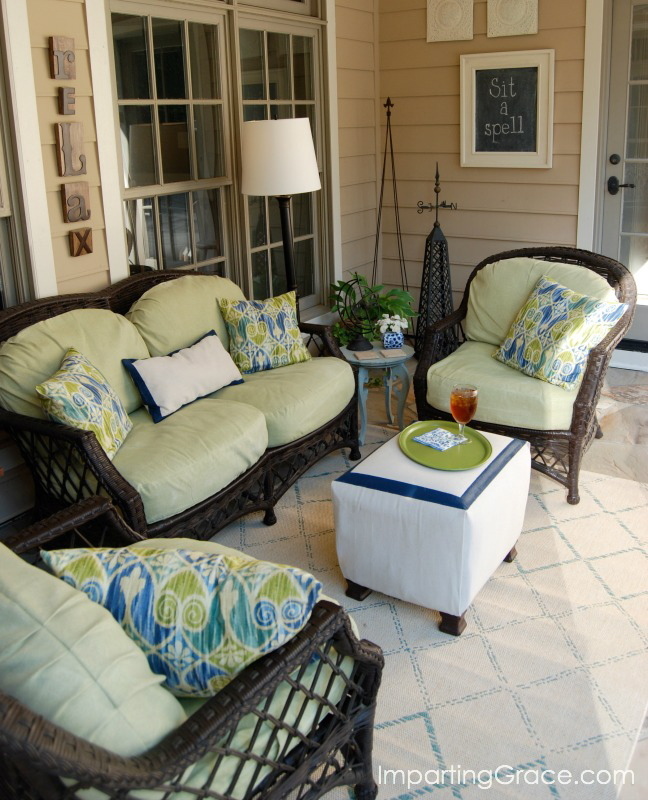 One of my favorite parts of summer is sitting out on my patio reading a good book, or enjoying a cup of iced tea. 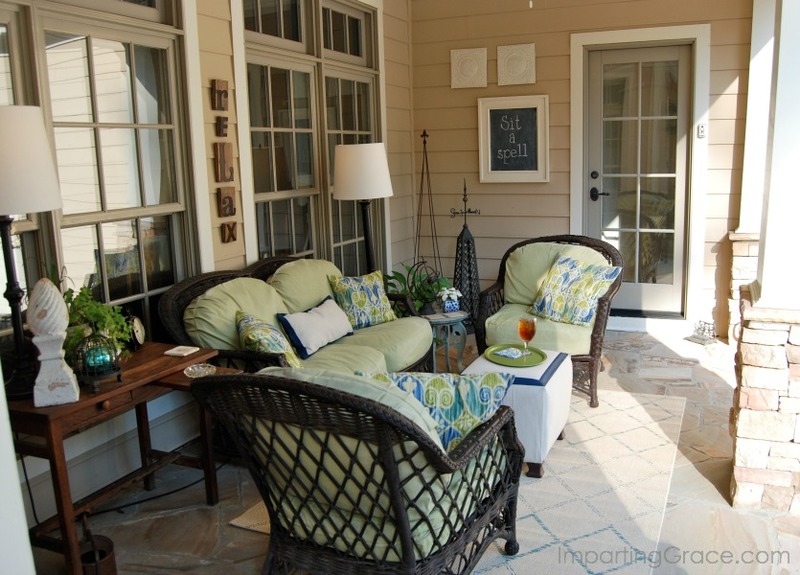 I just wish my patio was as cute as this! You did such a great job decorating! 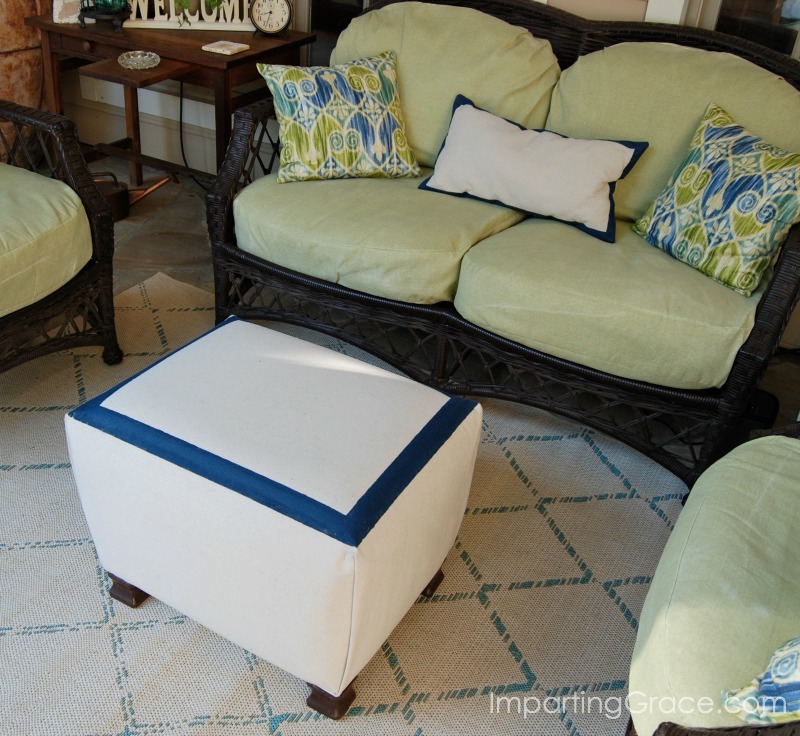 I can't believe you painted the little ottoman yourself, it turned out perfectly! Did you think of that yourself, or did you get the idea somewhere else?